Insert your SD card into your computer. You can use a USB SD card reader or go directly into the computer. Double click the lic.txt file to verify that the user ID, password and license key matches the PDA you are currently using (3). It should match the account screen on your PDA exactly (4). 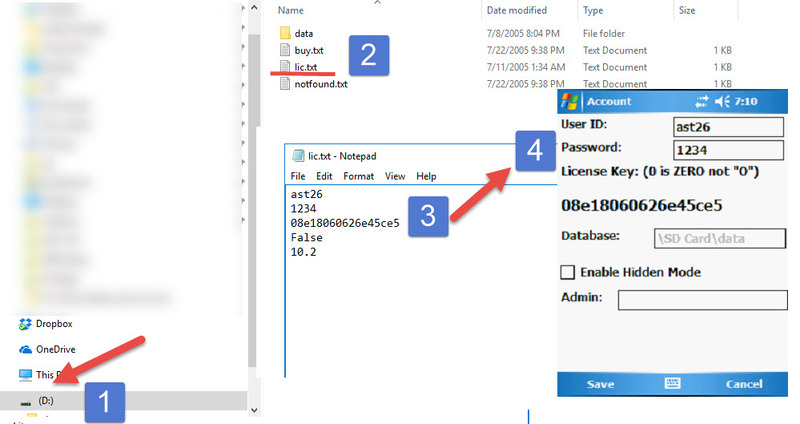 If one item does not match the account info on your PDA, you will not be able to download the database. If they do not match, insert the SD card into the PDA, do a soft reset, and repeat from step 1 to confirm the account info matches exactly.